My cover: All the pages started with watercolors. The cover used browns, some Naples Yellow and Caput Mortuum. I sprinkled salt. I made some scrabble tiles from sculpey, painted them and distressed them. My signature on the right hand side bottom, was done with my low wattage iron and rheostat and copper embossing powder. I love these colors. I took a class with Christine Ahmad through the Bow Valley Calligraphy Guild at the end of 2005. What an absolutely wonderful teacher and experience. 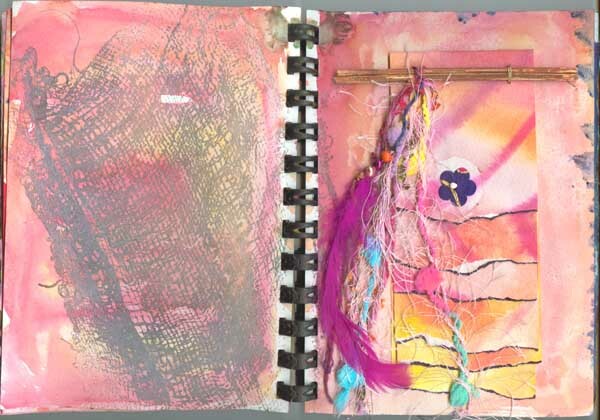 This is the journal I created during that class and will be expanded open over time. We each brought our own journal with whatever paper we wanted. 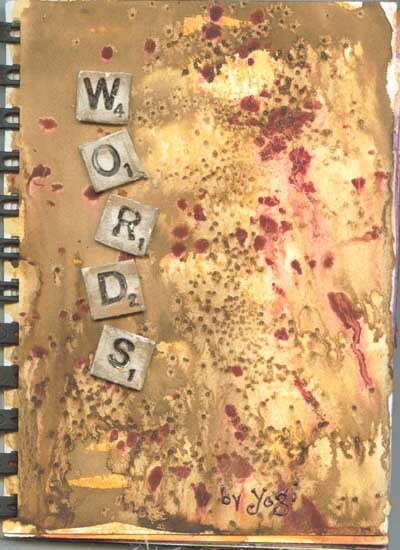 I used one of my coil bound journals and used Arches Hot Press watercolor paper. The first day of class we all decorated the pages using watercolors and anything else we had at hand. We separated the pages with wax paper to prevent the wet pages contaminating each other. It took a while to both decorate and dry the pages. 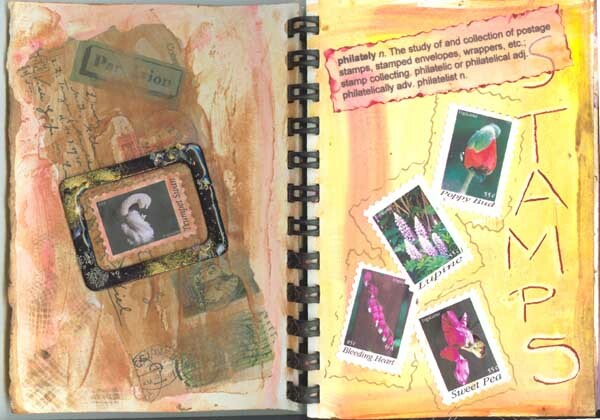 1st page "Stamps": I used yellows, a pale red and some brown. The left side I added a piece of scrapbook paper of stamps, spread some texture medium and brushed some brown stamp pad inks over some of the areas. The frame: I heavily embossed a black frame and added holeless beads and frozen opals. The stamps are my photographs reduced in size to create faux postage. Each of the pages has the word and definition pertaining to that topic printed on a piece of vellum. Philately n. The study of and collection of postage stamps, stamped envelopes, wrappers, etc. ; stamp collecting. philatelic or philatelical adj. philatelically adv. philatelist n.
2nd page: I used browns, thalo green, quinacridone magenta. On the right i put a piece of saran wrap scrunched up until dry. On the left side I just used a wide brush to make linear lines and some of the wax paper created a pattern. Page 3 "BFly": I used blues and violets. The left side is the runny dribble technique, then white areas outlined with a nexus purple pen. The right side is just an overlapping of colors with some water spritzed in areas. I used a wet clean brush to absorb some of the color and wrote the word BFly. When dry I used stamp pad inks, a piece of cut paper and a honeycomb plastic ribbon as a stencil and mask. I added a butterfly I found in a magazine. I printed the quote onto a piece of mulberry paper. Page 4: Similar technique as page 2 but done in greens and yellows with a touch of reddish brown. I have no idea what I will put on this page. Page 5: can't remember what I did on this page. But it's got magenta and pinks and looks like some saran wrap and a bit of salt technique. 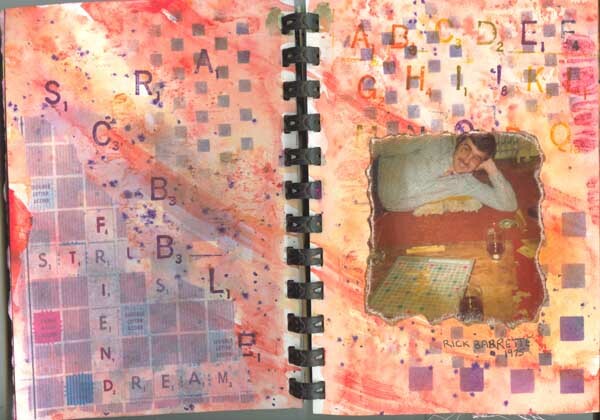 Page 6 "Scrabble": A word journal wouldn't be a word journal without Scrabble. The pic is of a friend from 1975. We used to have a lot of fun playing (I usually beat him). 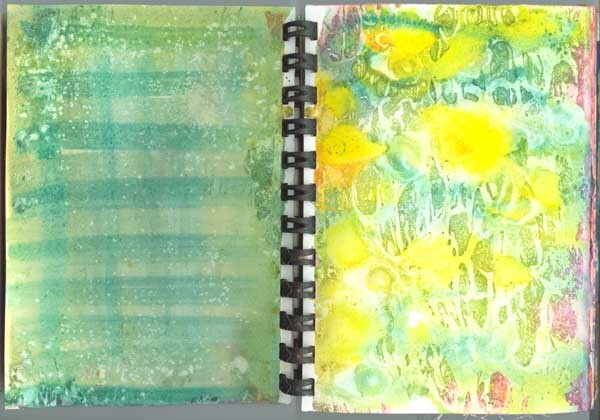 Both pages are done in oranges, when dry I used a square patterned stencil and stamp pad inks. I printed out a scrabble board on some tissue paper and glued it to the left side spread. Rubber stamped the word scrabble with a scrabble alphabet. 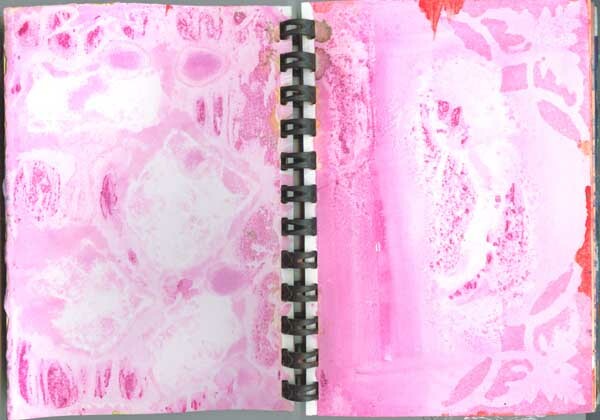 Page 7 "Booklet": I used diluted Grumbacher red. When dry I soaked a piece of cheesecloth in some dirty water, lay it randomly on the page and left it to dry. 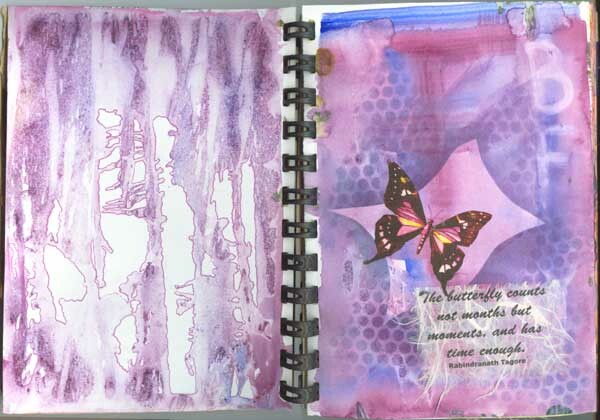 The booklet: I used Arches text wove paper decorated with an abstract watercolor theme. I edged the papers with a purple Pentel Metallic Brush Pen. I painted a couple of bamboo skewers in brown and attached the booklet with some copper wire. I added fibers, beads and feathers and a paper flower. It will have several quotes when finished but right now it only has one. 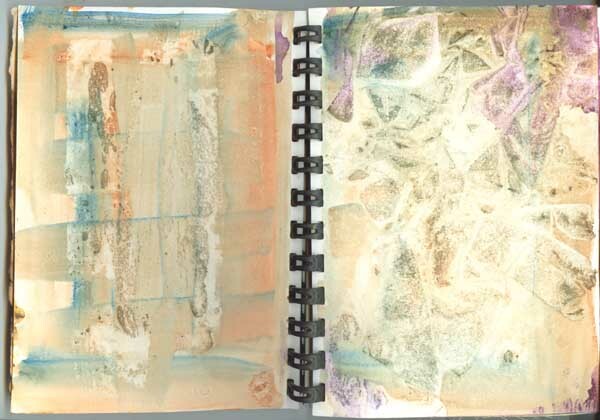 Page 8 "BFly2": I used blues, purple and a touch of green, salt and sprayed with water to get runs and blotches. I used a piece of blotter paper in the shape of a butterfly for the image in the upper right hand page. 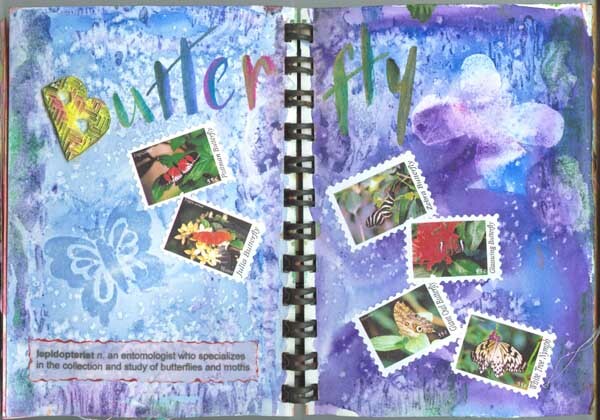 I used a butterfly rubber stamp for the left had page. I wrote the word Butterfly in a pointed brush lettering using twinkles H2o's. The large "B" is a letter I made from some sculpey and painted with twinkles. I printed some of my faux postage stamps of various butterflies. Words: Lepidopterist n. an entomologist who specializes in the collection and study of butterflies and moths.